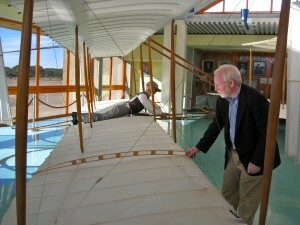 Rick Young, 1911 Glider reproduction builder for Soaring 100 Exhibit and First Flight Foundation Director, visits Flight Room at Wright Brothers National Memorial. Notice the difference in the curvature of the rib for the Wright 1902 Glider on display at Wright Brothers and the prototype rib for the 1911 Glider. The one-piece steam bent ribs of the 1902 Glider have straightened out over time.